Today I want to talk about how to create an analytics strategy. I can already hear people clicking to exit their tabs or move away from their computers but don’t do it! This means that having a solid analytics foundation matters. In this post, I want to help you understand how to create an analytics strategy even if you’re just getting started or don’t know much about the 100+ analytics tools out there. Seriously, the image below shows just part of the potential tools that you could implement. This is a list of 40+ analytics tools which doesn’t even include tools for email marketing, A/B testing, etc. An analytics strategy will guide your efforts as you implement different tools and try to figure out how to use them. I also want to help you figure what things you should focus on right now and what things you can ignore. This applies whether you’re using web analytics, mobile analytics or some other kind of analytics. Let’s first start by seeing what a lack of an analytics strategy looks like. Simply just “doing it” tends to be a bad idea when it comes to analytics. Choosing a tool because it seems to be “hot” or because “X company” uses it, is an even worse idea. The last part of that quote is the most interesting: whatever we build breaks. Imagine spending your limited development time trying generate key reports but they keep breaking and you have to do it all over again. This is an example of what happens when you don’t properly think through how you will use analytics and what you need to get there. Once you’re growing or spending significant money in marketing, it can be 10x harder to figure it out. After all, you will need analytics reports yesterday and your team won’t have the time to calmly think through the problem. Lucky for you, a small amount of time in the planning stages can save you a lot of headaches later on. Even if you find yourself in the same situation as the company mentioned above, pausing and properly thinking through the problem is much better than continuing to struggle to get analytics right. Let’s look at what you need to focus on when creating your analytics strategy. Before we jump into this section, I just want to mention that I won’t be talking about any specific tools. If you’re interested in that, I have an article on the best tools for different company stages and even the best tools for SaaS companies. During the planning stage of your analytic strategy, you need to be thinking of the fundamentals principles of how your company will use analytics. If you ask most founders, marketers or developers what the end goal or outcome of analytics should be, they will all say reports or dashboards. This means you’re interested in seeing a small amount of KPIs or metrics in an easy to digest format. It makes sense to start by figuring what metrics or reports matter to your company and work backwards to the implementation of specific tools. However, most companies do it the other way for some reason. Once you figure out what metrics & reports are important then you can figure out what events or tools you need. This also means that you only implement what you need and nothing more. This idea builds on the previous point of only implementing what you need. Instead of implementing 25 different events, focus on figuring out the top 5 events that you really need right now. Figuring these top 5 events will be much easier once you know what reports & metrics you want to see on a regular basis (see idea #1). What’s the difference between these two sign up events? This is also a good time to talk about companies who don’t have a lot of data but are trying to implement every single tool under the sun. This could be done with one tool and with a relatively straightforward setup. Keep it simple in the beginning. The last thing you should consider right now is who will control your data. If you want to export your data and work with it in excel or in an SQL database, can you do that? Most third party tools make it hard to export your data (especially all historical data) and this is something that can come back and bite you later on. Once you have answers to these 3 ideas, you can move on to figuring out what tools you need and how to use them. I also want to cover the things you can & should skip during this initial stage. These are some of the most common questions I hear from clients. There’s endless possibilities in the world of analytics and you want to do everything. You want to set up everything to be perfect right now. However, there are some things that just simply aren’t worth thinking about right now. This is the opposite of the idea #2 above: starting small. Just because you can implement 25 events doesn’t mean you have to. Most of the events won’t help you at all. If they aren’t needed to generate the reports & metrics that matter to you, then skip them. Related: The best way to think through your analytics events is to use an event tracking plan. You can download the same tracking plan that I use with my own clients. The second thing that I see startups waste a lot of time is in trying to choose the best tools possible. This is especially hard since a lot of tools out there are pretty similar and do roughly the same thing. Instead, start with 1-2 tools that will you generate the reports & metrics that you’re interested in seeing (are you seeing a pattern here?). You can always add more tools and easily switch tools if you end using something like Segment.com. This is a common problem and one that can be solved by talking to the sales team at a specific tool. They should be able to tell you the most common use cases and what their tool is designed for. If they tell you that you can do anything with their tool, find another company. Waste of Time #3: Can We Query Our Data Through SQL? This is one might be controversial to some companies. I get the importance of SQL and I think that most companies will eventually end up running all their analytics queries through a database but SQL isn’t relevant in the beginning stages. Let’s look at a typical early stage startup. You have a few people in your development team and you have a few people in your marketing team. Odds are, most of your marketing people (and non-technical people) do not know how to use SQL. Maybe eventually all marketers will know how to use SQL but alas, not at your company right now. However, you need to generate analytics reports. Should you figure out how to teach SQL to all of your company employees? Perhaps you should only hire marketers that know SQL? Or better yet, ask your developers to constantly run queries for you? No, you don’t do any of the above. Instead, you decide to use a third party tools like Mixpanel, Amplitude, Google Analytics, etc which can be used without having to know SQL. Related: If you’re interested in properly setting up Mixpanel, then I reccomend you check out a free video course that I created that will teach you everything you need to know about Mixpanel. If you get the foundation right (see idea #3), moving from third party tools to SQL databases when the time is right shouldn’t be a complex problem. Tools like Segment.com also make it easy to store your analytics data into a Redshift database which you can use once you’re ready to tackle more complex queries. This can give the best of both of worlds: third party tools for creating reports and long term storage of data to be queried through SQL. However, in the meantime, stick to third party tools that can be easily learned by everyone inside your company. As you develop your analytics strategy, you need to balance the need for perfection with what matters right now (reports & metrics). You can still take some decisions that will lay the proper analytics foundation for your company without having to sacrifice the usefulness of analytics today. I don’t think I can say it any better. Focus on getting your analytics to help you where you are right now while still thinking of how it will scale with your company. One final point about Segment.com. This is one of the most popular tools out there and one that I hear a lot from my clients. 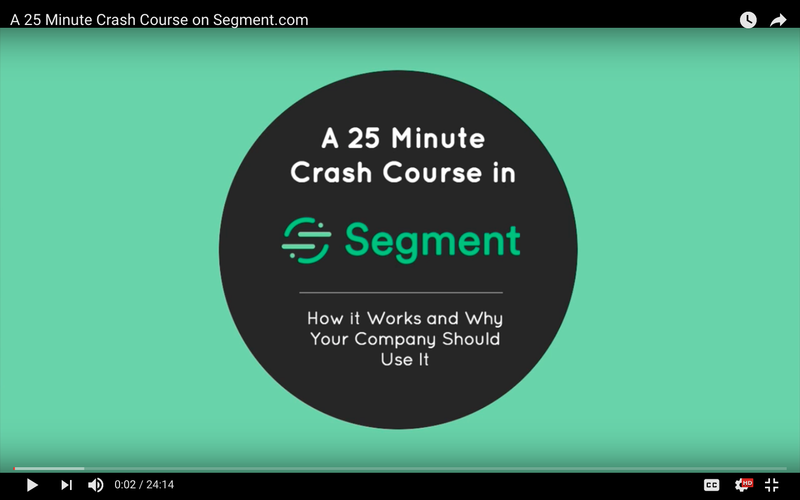 It is so popular that I created a short video explaining what Segment and what role it can play within your analytics strategy. Can I use Segment.com with Mixpanel or Intercom or Kissmetric or X tool? What is the difference between integrations and sources in Segment? Is it hard to track data with Segment? Why should I care about Segment? Let me know what you think in the comments or message me @ugarteruben.